~~GuRu bHaI~~: DEVELOPED INDIA IN 2020?! Indian history cites only a very few people as celestial Gentlemen who have dedicated themselves holistically for the welfare of our motherland. They are appraised being more than humans for their selfless contributions throughout their lifetime. One of such living legendary human who was the first citizen of the country and always inspires the young India is Dr. A.P.J. Abdul Kalam. He is undoubtedly the most optimistic fellow of the century who foresees the developed India in 2020. His vision is crystalline if everyone happens to stand in his shoes. But, the biggest query rises in our minds is “How far is this construction of roadway towards this mammoth goal despite all the contemporary complex happenings of the country? What could be the possibility or in fact the probability rate in accomplishing it in the offing?” We could hardly find the resolutions to these rhetoric queries. Though his anticipations are out of the purview of the possibilities, we could still ascertain the impediments which negate his vision “Developed India in 2020”. According to this gentleman, professionals, businessmen, leaders and researchers need to stick to innovative ideas which would likely to buttress our country’s stand aloud in the global arena. In that case, he could able to foretell the following ten pillars of development which would happen on one fine day. I would like to discourse the current antecedents and corollaries of his each perspectives towards the developed India. · A nation where the rural and urban divide has reduced to a thin line – With the unconventional distribution of money flow and the trend of rich getting richer and poor getting poorer, the scale of vacuum is getting magnified. So, damping the line between the rural and urban India is quite unachievable. · A nation where there is equitable distribution and adequate access to energy and quality water - Torpid state in interlinking of national rivers is diminishing the availability of quality water and scale up the scarcity throughout the country. With the growing population, the energy requirements also extravagantly booming up which need numerous sources to be established which is barely happening here. · A nation where agriculture, industry and the service sector work together in symphony- Although agriculture is the backbone of our economy which comprises almost 60% of our GDP, rapid grooming of urbanization and industrial sectors deteriorates the development in the field of agriculture. So, harmony is completely lacking in the Indian economy with unbalanced contrasting outgrowths. · A nation where education with the value system is not denied to any meritorious candidates because of societal or economic discrimination – Unless the education in India is centralized with knowledge mining, no values could be purveyed to this forthcoming generations. Also, biased pseudo discriminations curtail the nourishment of deserved students which would result in discouragement of actual talents in the country. · A nation which is the best destination for the most talented scholars, scientists and investors – Obliviously, our nation serves as the best destination for corruption, dirty politics, false reservation and much more brutal stuffs which obviously never ever encourage the talents in any dimensions. · A nation where the best healthcare is available to all – Unless all the parliamentarians and bureaucrats are strictly constrained to have their medical treatments only in Government hospitals, we could not imagine any improvement in the conditions of healthcare in the near future. · A nation where the governance is responsive, transparent and corruption free – The Government is free from responsiveness and transparency but not from corruption. Scams and scandals would likely to be prescribed as the policies of a democracy. Corruption is deep rooted in all centrings of the country which should be obliterated holistically which needs a longer span of reaping. · A nation where the poverty has been totally eradicated, illiteracy removed and crimes against women and children are absent and none in the society feels alienated – Poverty and illiteracy are literally the tumours of our national development and the culmination of which needs a huge exacting efforts from the Governments side in widening the opportunities for employment and quality education. Not only women and children, also the actually dejected communities in the society should be ensured for their safety livelihoods and also their status should be economically and socially promoted. These forethoughts need our political parties to relinquish vote bank politics. 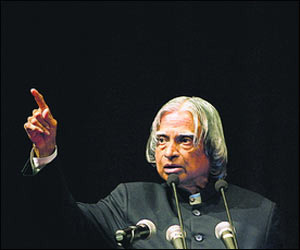 · A nation that is prosperous, healthy, secure, peaceful and happy and allows a sustainable growth path – With the habitual prevalence of ambivalent national conditions, it is hard to promise Kalam sir that we would mould our country with these fictitious adjectives like prosperous, healthy, secured, peaceful and happy. · A nation that is one of the best places to live in and is proud of its leadership – From pre independent era to even today, prominent leaders of our motherland can be easily numbered which would never give the superlative privilege of being proud of our national leaders. Besides, intrinsically, India is more than a best place to live. But, we have a long way to groom our country synonymous to the saying “Heaven to live”. May be like Asian “Denmark” or “Norway” in the future. These are the prognostications of developed India in 2020 which is just eight years ahead. This predicament situation of the country needs many reiterative reforms in all dimensions to make it immaculate in all means. Contemporary phase of reforms and lucrative policy making would render the above developments may be in 2050 but not in 2020. So, in order to transform Kalam sir’s pipe dream to a real one in 2020, I could ponder only one possible solution. Yes, it is “Revolution”. It is high time to refrain the nation from being devastated further more. Greatest boon of the time is that more than 50% of the Indian population is below the age of 25 and more than 65% are below 35 which is indeed the marvellous potential. So, India is pretty younger enough to chuck out all the existing quondam systems of the country. Youth power can literally make anything to happen on earth. Now comes the responsibility of the Leaders, writers, scientists and all influential identities to start kindling the need of the renaissance in our country to the young minds. By fuelling the youth power in a productive phase, we could taste the Developed India in the offing with no much encumbrances on the track. If it is likely to happen, we can do wonders before 2020 and live the dream of this extraordinary gentleman. Awaiting my country to become aloud in the global podium! Vision of Dr.A.P.J.Abdul Kalam has been taken from his recent biographical book “Turning Points – A Journey through Challenges”.